House in Açoteias Village with private pool. Ideal for families. 5 bedrooms, recently renovated and decorated. Quiet and well maintained village. One possible experience to be shared! Decorated with a personal vision, the "House of Açoteias" gives all who visit a real quiet retreat in a cozy atmosphere. Enjoy the privacy of this house, where the wide spaces and comfort coexist perfectly. Ideal for a holiday deserved family or friends. This is your ideal getaway! 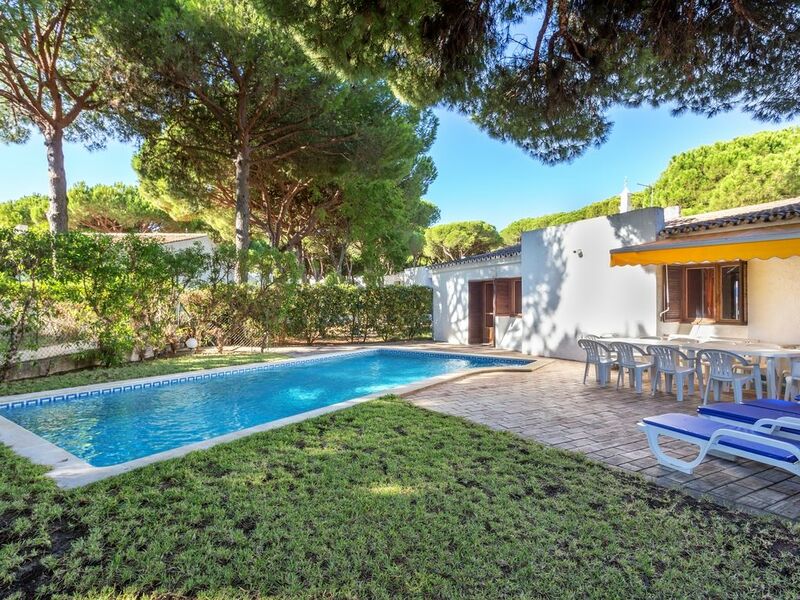 Remodeled in 2012, this 5 bedroom house - for up to 10 people, 3 bathrooms, private pool and garage, allows you to enjoy in private two carefully tended gardens and maybe a hot summer night, hold a BBQ one of the two available Algarve chimneys. Only one floor, the "House of Açoteias" is ideal for people with reduced mobility, as only has 3 small steps that allow make a "visual division" between the living room / dining room and the hall of the rooms. Wi-fi and TV with national and international channels, a service provided by the MEO. House with two fronts: the front and rear garden with pool and sun loungers. Private outdoor parking for 3 cars. Roof terrace, throughout the house usually referred to as "Roof". 2 fireplaces with the possibility to barbecue. Only one floor, the "House of Açoteias" is ideal for people with reduced mobility, as only has 3 small steps that allow make a "visual division" between the living room / dining room and the hall of the rooms. Great holiday, well equipped, clean villa, plenty of space inside and out. Help on hand from very friendly support staff nearby. Good location, within walking distance of shops and restaurants. Great beach only 10 minute walk away if you can find the direct route, Best local restaurant in our opinion Salt & Pepper, great food and service although looks nothing from roadside. Villa could do with additional sun beds to cater for 10 guests, pool area could also benefit from a little attention, but this wouldn't deter us from recommending, Diolch o galon Sofia am bob dim. Thank you so much for spending your time writing and sharing with future guests your recent stay with us. For us, each constructive feedback is a new chance to improve year after year. We also loved to have you all with us. See you soon. We just came back from a 3 night stay at this lovely villa. Perfect for kids, and very well equipped. Everything was very clean and well maintained. The bedrooms have brand new mattresses. I guess we were the first ones to try them! Lucky us! We will for sure come back during spring time! We had an amazing and unbelievable stay. The villa is just what it look like in the pictures: a very comfortable family house. Located in a private condominium it’s perfect for families with kids. Only one floor villa which is a plus for families with small children. The Kitchen is very well equipped and clean, as well the bathrooms. The beach is very close by so as restaurants and bars. Thank you Antonio for welcoming us so well. We will for sure come back next year! Thank you so much for you kind words. We are really happy that you’ve enjoyed your stay. Please come back soon! Wir waren eine Woche mit 9 Personen. Das Haus ist sehr schön und gemütlich.Die Küche ist gut ausgestattet. Man kann verschiedene Strände sehr schneĺl erreichen .In wenigen Minuten erreicht man einen kleinen Supermarkt wo man das nötigste besorgen kann und alle sehr freundlich sind.Überhaupt sind wir überall sehr freundlich bedient worden.Es war ein sehr erholsamer Urlaub in einer sehr schönen Gegend. Thank you so much for spending some time writing a review about your recent stay in our family property. We are really happy to know that you enjoyed a lot and please come back soon! 15 jours de vacances très agréables en Algarve. Sofia nous a transmis toutes les informations avant et durant le séjour (par sms et email). Feliciano et son voisin parlant français étaient là pour nous accueillir. La maison est propre (avec 1 nettoyage hebdomadaire), grande avec son couloir de desserte permettant de bien aérer (pas d'utilisation de la climatisation). La cuisine et les 3 salles de bains sont fonctionnelles et bien équipées. Nous avons pris tous nos repas dehors. La piscine est agréable pour se rafraîchir et entretenu quotidiennement par Feliciano (disponible pour tout problème). Le village de vacances Açoteias est familial, calme (sans circulation de voitures). Accès à la belle plage de Falaisia (15 minutes à pied sans bouchons ou recherche de parking) : belle et longue plage avec ses falaises ocre/rouge agréable à toute heure. Les restaurants, les supermarchés, le poissonnier sont tous accessibles à pied. Bref, la belle vie ! Adresse à recommander pour des vacances farniente. Une suggestion : isoler phoniquement le local pompes de la piscine. Located in Aldeia das Açoteias, one of the most legendary Algarve Villages, surrounded by centuries-old pine trees and close to one of the best known beaches in the Algarve - the Falesia, easily accessible, both on foot and by car. The "Villas of the Acoteias" gives you the possibility to explore all that the Algarve has to offer you within walking distance. The preferred location of Aldeia das Açoteias allows you to easily enjoy endless miles of beaches on the Algarve coast, countless internationally recognized golf courses or the bustle of Albufeira and Vilamoura. Next to restaurants, banks, supermarkets, Sheraton Algarve Hotel, 'Pine Cliffs' golf course, bars, cliff beach and Olhos d'Água.